The Lake Stewards of Maine (LSM) work to monitor a broad range of environmental indicators that affect the health of Maine Lakes. We have over 500 trained volunteers who collect quality scientific data. Their monitoring data and observations provide an extremely valuable resource for lake protection and a vital first-hand account of the evolving conditions of Maine’s Lakes and Ponds. Volunteer monitors use a Secchi disk and view scope to measure water clarity. The LSM trains and certifies volunteers to collect scientific water quality data of the highest quality. Each volunteer participates in an initial training workshop and is re-certified on a regular basis. Most volunteer lake monitors collect transparency (water clarity) data with a Secchi Disk and a viewing scope. Volunteers collect data every two weeks from May to October, and submit their data three times per season directly to the LSM: June 30, August 31, and at the end of the season. The LSM staff reviews the data and forwards it electronically to the Data entry coordinators, who enter the information collected into a database. The data are compiled by the Maine DEP, which then creates the individual lake reports, which are published in the spring. Volunteers are also trained and certified to collect other types of water quality information, including temperature and dissolved oxygen profiles and the concentrations of Phosphorous and Chlorophyll a. Volunteers can also be trained to monitor other important physical, chemical and biological characteristics of lakes. • The number of volunteers who monitor water quality on an individual lake is generally limited by the size of the body of water. If a lake is already being monitored, a new volunteer may be trained as an “alternate”, or in some cases, to partner with the existing volunteer. On large, multiple-basin lakes, it is often beneficial to have several volunteers involved. Please contact the LSM office if you have questions about whether or not there is a need for additional volunteers on your lake of interest. • Volunteers must attend a ½ day orientation, training and certification workshop before collecting and submitting data. Workshops are offered in the spring through early summer. Check the date, time and location of upcoming training workshops on our website. • All volunteer lake monitors begin the process of monitoring their lake by collecting Secchi disk transparency (water clarity) data. The LSM provides volunteers with a Secchi disk with calibrated tape and a viewing scope. Volunteers are expected to maintain the equipment and to return it to the LSM if they leave the program, or pass it along to their replacement monitor, if one is available. Training is also provided for collecting total phosphorus surface grab samples. However, at this time funding is not available to support laboratory analysis for phosphorus samples. Therefore, phosphorus sampling is optional. • Volunteers should plan on taking Secchi disk transparency readings approximately twice monthly (every two weeks) from May through September, and be able to make a multiple-year commitment to monitoring. • Volunteers must attend an in-person re-certification workshop at least once every three years, unless they test annually with the online Secchi Simulator. If monitors test annually with the online Secchi Simulator, then they only need to get re-certified in person every 6 years. 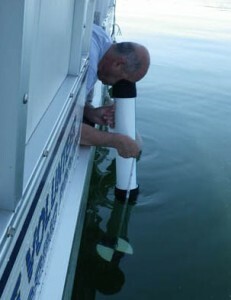 • Volunteers who wish to receive advanced training to monitor other indicators of lake water quality must submit at least one season of Secchi transparency data first. Advanced monitoring generally requires annual re-certification. • Volunteer monitors must have access to a boat (and in most cases, a motor) because Secchi disk readings are generally taken at the deepest point in the lake basin. A strong anchor and rope are also required. Quality Assurance Project Plan (PDF 150k) – The EPA approved guide for lake water quality monitoring by LSM volunteer monitors. Listing of all lakes with water quality monitors.